For more information about the WPSL, tryouts, schedule, etc., please contact Jay Hammond at [email protected]. 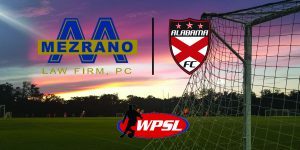 We would like to Welcome Mezarano Law Firm as our 2019 WPSL Sponsor. The Women’s Premier Soccer League is an independent national league whose main focus is on the development of highly competitive premier women’s soccer teams. The WPSL was formed in 1998. It is sanctioned by the United States Adult Soccer Association (USASA), which is an affiliate of the United States Soccer Federation (USSF), the ruling body of soccer in the United States, and FIFA, the world’s ruling body for soccer. The WPSL is unique in that teams are involved in discussions pertaining to issues regarding the league. Anyone can access information about our league such as: current teams, rosters, statistics, schedules, results, constitution and by-laws, forms, meeting minutes and the latest league news at our website. The league expects new teams to conform to our minimum standards. We expect every team to achieve all WPSL standards. Standards that we stress include a good playing surface, water for players provided by the home team, ice and a trainer at all games, professional conduct and adherence to the league constitution and by-laws. The WPSL season runs from May 1st to Aug. 1st. There is a league championship tournament on the last weekend of July. Its location is determined each year and is moved to different parts of the country each year. Teams can expect to play 10-16 games during the season. You have a chance to participate in an exciting, growing league whose focus is strictly upon the development and promotion of WOMEN soccer players. We have a foundation of committed and well-regarded teams located throughout the nation. You can make it happen! Promote and develop independent women’s soccer at the highest level. Provide a playing opportunity for elite women soccer players at the highest level. All are dedicated to the success of the league as a whole as well as to their own success, recognizing that they cannot long succeed individually without the league succeeding. Make every effort to bring quality soccer to all levels of the community and to youth programs. Promote the stature of female athletes as role models for the youth. The great variety of highly skilled players is what makes the WPSL truly successful. WPSL teams roster college, post-college, foreign players and talented high school players every year. Many college programs encourage their players to play in our summer league because they believe it helps them prepare for the upcoming season. These players gain tremendous experience playing alongside other dedicated, competitive players, some of whom are former professional soccer players and others who are aspiring to become professionals on or off the field. Over the years, hundreds of players have spent their summer breaks playing on WPSL teams. Most come from highly regarded collegiate programs such as: Santa Clara, Portland, Notre Dame, North Carolina, UCLA, UC Berkeley, UConn, Penn State, Princeton, Harvard, CSU, UMass, USF, UOP, BYU, San Jose State, Stanford, San Diego State, Arizona State, Texas A&M, Denver University, UC Davis, U of New Hampshire, St. Mary’s, Boston University, Nebraska, USC, Long Beach State, BYU, North Carolina State and many more. Collegiate programs have utilized our league to improve their players’ development and sustain their fitness over the summer months. Highly competitive youth clubs also have used our league to expose their players to teams that carry players from every level – national, collegiate, post-collegiate and youth – and they then carry the experience they’ve gained, individually and as part of a team, into their local league competition in the fall and spring.